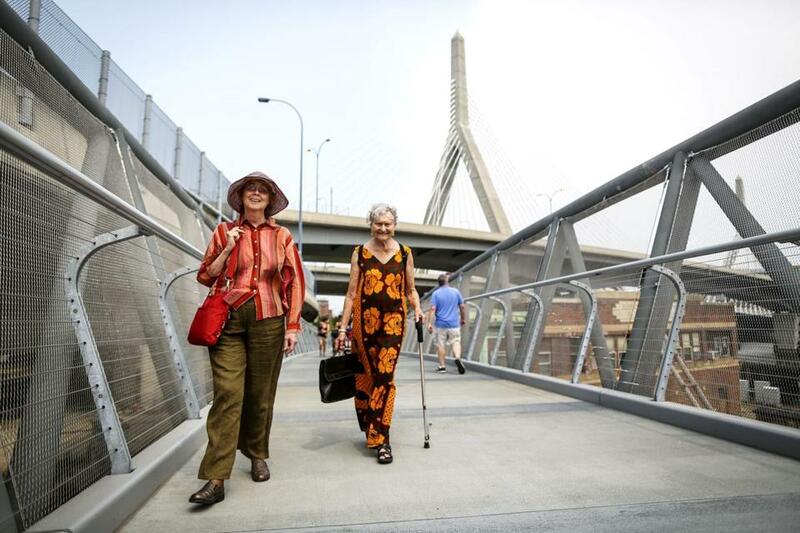 Liz Goodfellow and Carol Johnson walked together along the North Bank Bridge in Cambridge following its ribbon cutting ceremony. For THOUSANDS of runners and walkers and cyclists, the landmarks that matter most in Greater Boston appear not in tour guides, but along the miles of trails that line the Charles River. There’s the plank walkway near the Boston University boathouse; the crazy, jury-rigged connections between the Esplanade and the eastern end of the Longfellow Bridge; the bare paths, worn footfall by footfall, on the riverbank by MIT. Now there’s a new extension of those trails, and another landmark: a surprisingly elegant pedestrian bridge through an odd area that was radically reshaped, but left unfinished, in the Big Dig era. Until the North Bank Bridge opened last weekend, the area along the river between East Cambridge and Charlestown was well off the trail system, and might as well have been the dark side of the moon. Had it been more accessible, it might have attracted illegally dumped tires and car batteries or worse. Work on the project began in November 2009, and the change since then is dramatic — in more than one way: In a time-lapse YouTube video, crews from contractor Barletta Heavy Division Inc. assemble the bridge to a soundtrack of throbbing classical music. The pricetag has raised some eyebrows: The $8 million cost of the pedestrian bridge — which curves over working train tracks and a Duck boat launch and under highway ramps — was part of a larger $26 million initiative funded by the 2009 federal economic stimulus law that also involved work on the grounds on either end. Still, the North Bank Bridge, originally planned as part of the Big Dig, was the kind of project that many stimulus proponents hoped to see more of: a long-awaited infrastructure improvement that suddenly becomes realistic when there are lots of federal funds available. But despite hopes that the recession could, if nothing else, herald a great era in city-building, plenty of imaginative public projects just weren’t shovel-ready. Which makes the completion of North Bank all the more meaningful. Building new connections between neighborhoods often stimulates development in unpredictable ways. As pedestrians and cyclists gaze up toward the Zakim Bridge, they might also look longingly across the river and wonder why there’s no corresponding path there. Fortunately, the Department of Conservation and Recreation has set aside money for a South Bank bridge in Boston. If a strange, off-limits stretch of one riverbank can yield an inviting 21st-century landscape, it can happen on the other side.